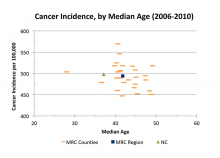 In 2007, cancer surpassed heart disease as the leading cause of death in North Carolina. The incidence rate is expected to continue to grow as the state’s population increases. Because cancer is most often a disease affecting older people, the rates of cancer are expected to increase more dramatically over the next several decades. The Mountain Resources Commission (MRC) region, which has an older population compared to the rest of the state, is likely to experience a similar increase, but may see even higher incidence rates due to retirees’ growing interest in the area. 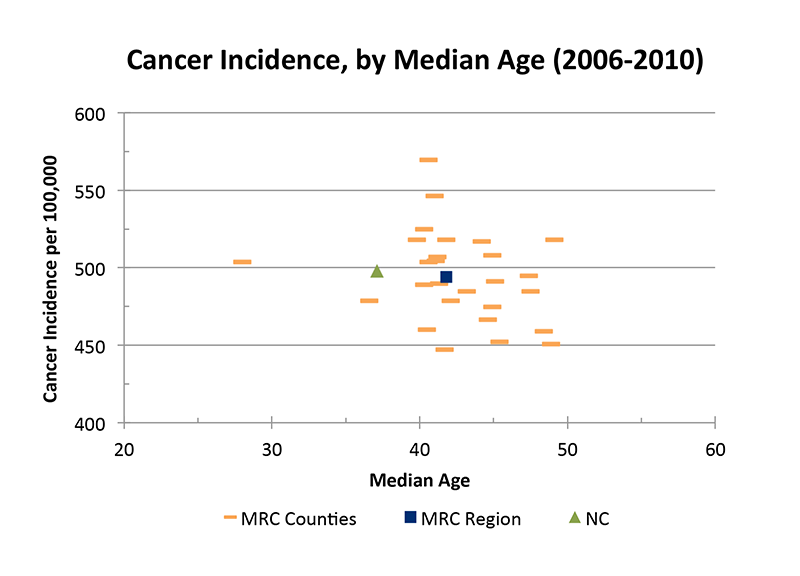 As for current estimates, data collected by the North Carolina State Center for Health Statistics for the years 2006-2010 indicates that the MRC region is just below the state’s overall incidence rate for its more common cancers – colon, lung-bronchus, breast (female), and prostate. These cancers account for a substantial percentage of North Carolina’s total cancer deaths and new cases. Among the MRC counties, Avery, Alleghany, and Polk have the region’s lowest rates – nearly 10 percent lower compared to the state – despite having higher median ages. It should be noted, however, that these counties have populations much lower than that in other MRC counties. 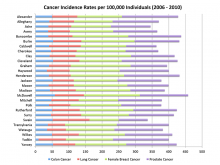 These populations may therefore have limited access to health care, causing patients to seek treatment in other counties and thus lowering their rates of cancer incidence. Swain, McDowell, and Burke, on the other hand, have incidence rates nearly 10 percent higher than both the state and the region’s rates. Generally, it is recognized that a majority of cancers are associated with personal lifestyle – such as smoking, diet, and other environmental factors – and are therefore preventable. Other factors, including age, gender, and family history, are also associated with the development of cancer and can aid in the identification of people at high risk. For many of these cancers, treatment is available and can be effective, but early detection and regular check-ups are very important in the prevention of cancer-related deaths. For more information on cancer-related deaths, please see Deaths From Heart Disease, Stroke, Cancer, and Diabetes. North Carolina Department of Health and Human Services, Division of Public Health, State Center for Health Statistics. 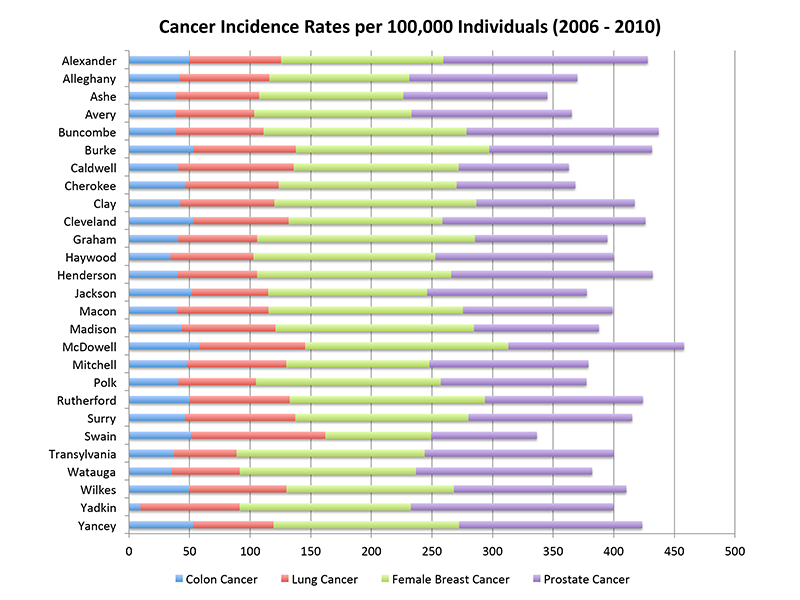 Cancer Profiles. Accessed from: http://www.schs.state.nc.us/schs/CCR/cp2013/.